Every year I get so into spring. Like, so freaking motivated. Maybe even more motivated than I was in January to erase the disgusting damage I did by shoveling handfuls of Christmas cookies in my mouth two times a day (maybe three, I'm sure there were breakfast cookies in there somewhere). But motivated in a different way - motivated in a productive, gorgeous-weather-induced energized kind of way. I suppose spring cleaning is a cultural emblem of the season for a reason. So, there's a raised bed vegetable garden in the works (despite my decision to forgo it last year) and I have grand visions of growing rows and rows of lovely vegetables. In reality, I'll probably kill them all. I hate Denver. 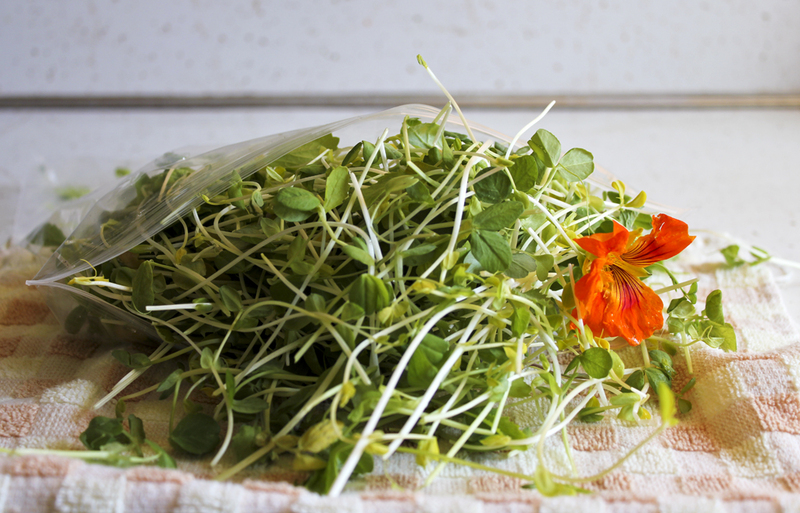 Microgreens are so trendy. I'm embarrassed to post about them. I promise I won't post about them when my garden is full of them. Even if that's probably as far as my veggies will grow since they'll soon after wither away for lack of water and blaringly awful sun. Sometimes I like trendy things, though. I wish I could prove that I was into them before they were trendy, but I can't always. DAMMIT. 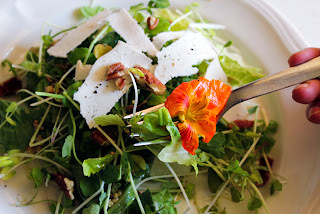 In any case, I love little microgreens - the little baby plants that are so wonderfully peppery and bite-y. This cute market near my house carries them in big ziplock bags and you can find flowers strewn in them. So perfectly spring. The flowers are both sweet and super spicy. And then putting them in a salad makes you feel like your life will be practically perfect in every way. So my new job is going pretty well. I'm still glowing from the novelty of benefits after not having really any for a couple years. There's a gym on campus that I'm psyched about and I've somehow gotten three people who want to train under my expert tutelage. Ha. I also get to go on walks - whether it's to various buildings for work purposes, or just to take a break and do a 1.5 mile loop around the campus. Easy to please, I guess. I missed walking so much. I never got to walk in my last job. Except for occasionally when I'd just leave and walk over to the animal shelter across the street. Those were terrible ideas. I almost got a cat every time. THEY NEEDED ME. 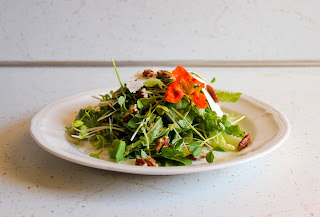 While not the most original recipe around, this salad is just kind of an inspiring welcome to spring produce recipe... and, isn't it nice to be reminded of how good salads are? I suppose you could have been eating salads during the winter, but bleh, those don't really count. 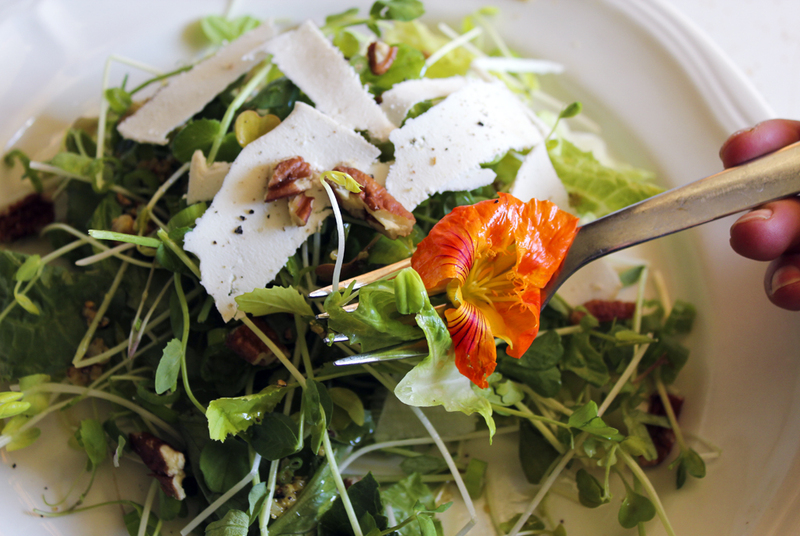 I hope you can find microgreens around. It's getting a little late for them - I'm struggling to be timely with my blog posts. I'm actually feeling a little overwhelmed with everything that I need and want to do. Like really, majorly overwhelmed. I try to do too much. Sigh. 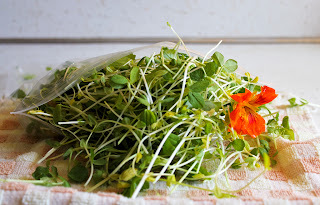 microgreens, from a variety of plants - arugula, mizuna, lettuces, radishes, etc. To make the dressing, heat the olive oil over low heat and add the garlic. 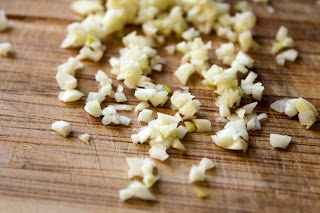 Cook the garlic for 5 - 7 minutes, until the garlic is very lightly turning brown, but don't over cook it!! 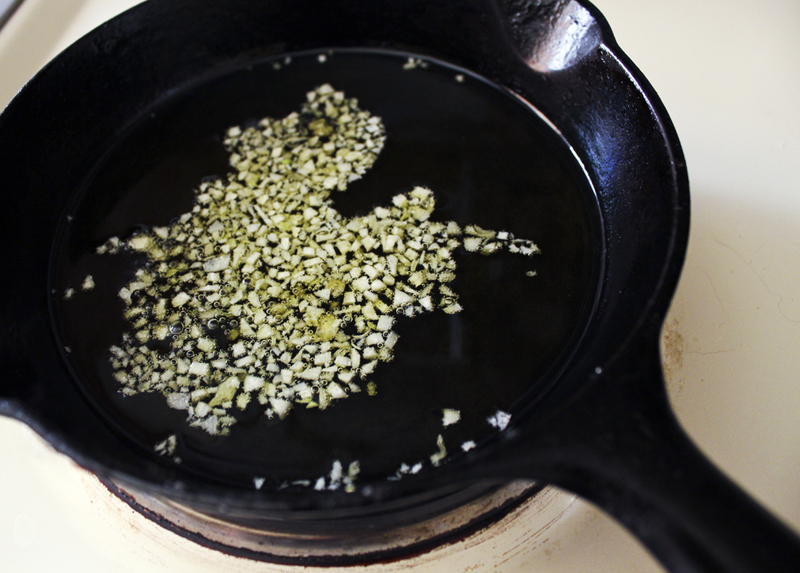 Remove from heat and let cool for a bit. 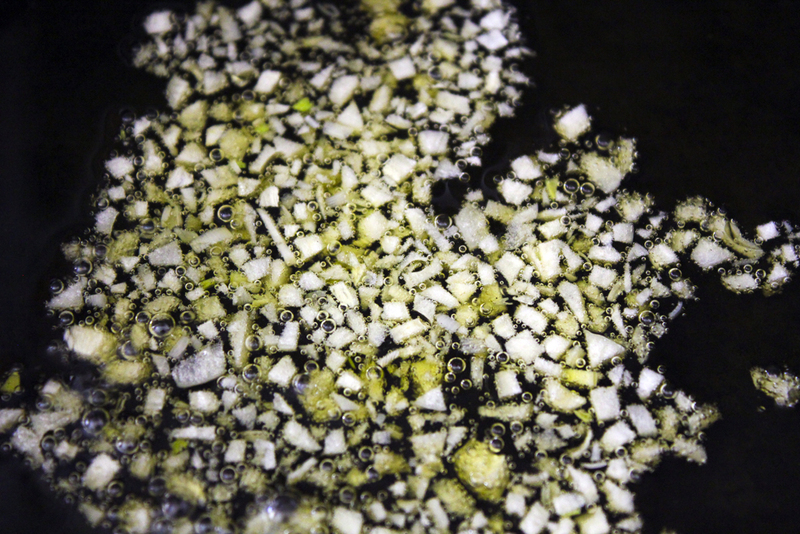 Whisk in the mustard and salt and pepper to taste. Wash and dry microgreens and lettuce (be careful with any flowers!). Rip lettuce into bite sized pieces and rip microgreens in half if they're kind of long. Toss the greens with the green onions and pecans. Drizzle with dressing and top with some shaved cheese and more coarse sea salt and pepper if you want. Gorgeous! I hope spring is motivating you to be wonderful!